When you hear that word, what image pops into your head? Do you picture the long-haired blonde of the eighties with her leotard, spandex, and leg warmers? Or how about the older woman who finishes a water aerobics class and then saunters in for a few movements on the jazzercise floor? What about the Grinch? If you laughed out loud, you are why the writers of The Grinch Who Stole Christmas inserted Jazzercise into the Grinch’s monologue of excuses for why he couldn’t attend the holiday party. It is one of the funniest scenes in the movie and it’s also one of the first times that 20-year-old Jacob Krech ever heard about Jazzercise. Whatever visual you have, I would venture a guess that it doesn’t immediately include the Grinch, and it most likely doesn’t include a man. 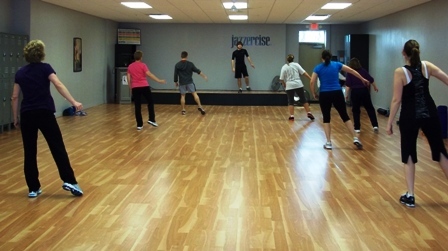 I have been Jazzercising for several months now. (some of you may remember my admission in a previous blogpost) I was immediately struck by the fact that there were no men in these classes…that is until Jacob showed up. Not too long after I started, a young man began dancing in the row in front of me. He jumped higher, slid further, and moved bigger than everyone around him. It took everything I had to try to keep up with him, and I was usually reminded (for days) that I am not young enough to move like that. His passion for dance and movement is immediately evident, and I was thrilled to hear that he wanted to instruct. 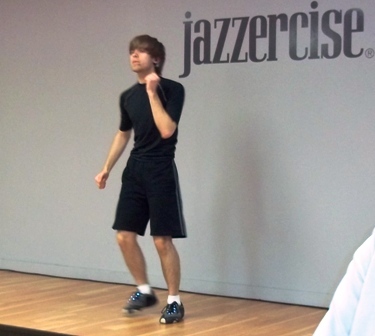 He is now a certified instructor and he teaches Jazzercise classes in Woodbury. He joined his mom and his sister at classes in the fall of 2011, and it did not take long for him to realize that it was a good fit for him. Jacob has been passionate about dance since high school, becoming particularly interested in modern dance while attending St. Paul Conservatory for Performing Artists. The younger brother to only sisters, Jacob feels incredibly comfortable being the only man in the room. He’s right. It is what keeps people coming back and a reason why men would be warmly received if dance is something they enjoy. Will Henke, a friend of Jacob’s and the only other man pictured above, is a college sophomore who played football in high school and is currently training for his first marathon. He has had dancing experience, but he was still nervous about going to the classes. He worried about keeping up with the movements, but his mind was quickly put at ease. Will told me that it was a good workout and a lot of fun. “Everyone just does their own thing,” he said. It’s true. You hardly notice what anyone else is doing, (except of course if Jacob is dancing in the row in front of you) and you just do what you can to keep up. There are no mirrors to distract you, and the music always compels you to keep moving. You are accepted exactly as you are and inspired by the dancers around you. Jacob has a challenge for all the guys who are unsure about trying something that seems so far out of their comfort zone. Jacob Krech has made a choice to grow through dance, and there is something incredibly inspirational about watching someone do something he loves. Besides teaching Jazzercise classes, Jacob works 4 am shifts at Target and he has recently been cast in The Hobbit at The Open Window Theatre in Minneapolis. If you know someone who needs to be celebrated for Choosing to Grow, I would love to hear about him/her. Send nominations or story ideas to choosingtogrow@meaganfrank.com. To learn more about Choosing to Grow or Meagan Frank, visit her website: www.meaganfrank.com. Nice post Megan – Jacob is an asset to the community and I appreciate you sharing it with everyone!